Garuda Select drop into the Tigers Barn, Telford Tigers will welcome a group of 24 Indonesian U17 footballers to the Telford Ice Rink for the 2nd leg of the NIHL Moralee Conference Play-off quarter final against Solihull Barons this Sunday. 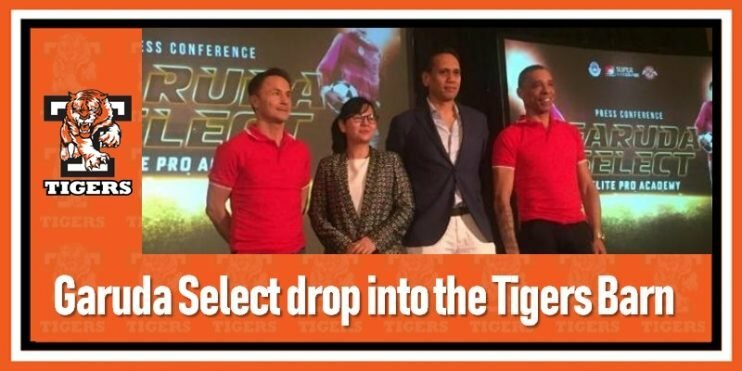 The Garuda Team Select, arrived in the UK in January for 6 months of intensive football training in the home of football under the watchful eyes of Technical Director Dennis Wise, ex Chelsea and England International, and Head Coach Des Walker ex Nottingham Forest, Sampdoria and England star. The venture organised by PSSI and sponsored by SuperSoccer TV is aimed at developing Indonesian football and the program will provide benefits to the young players to study and receive intensive professional training from British coaches. The Garuda Select program was chosen to run in the UK because of the recent worldwide success that has been achieved by the England junior systems with England U-16, U-17, and U-20 all winning international competitions recently. “This program provides a great opportunity for talented young people in Indonesia to grow and become more than just soccer players. We are looking forward to what will happen, and we are ready to help the program, and will do what we must do to make it a success. “said Dennis Wise. The program is also an opportunity for young Indonesian coaches to gain valuable insight into different coaching methods used at top level professional clubs across the UK. Telford Tigers want to wish the team and coaches all the best for the remainder of their stay in the UK and hope they really enjoy their first taste of Ice Hockey, the fastest team sport in the world.